Figure A. RPE conjugated Rat anti Dog CD4 (MCA1038PE) and Alexa Fluor 647 conjugated Rat IgG2b isotype control (MCA6006A647). Figure B. RPE conjugated Rat anti Dog CD4 (MCA1038PE) and Alexa Fluor 647 conjugated Rat anti Dog CD8 (MCA1039A647). All experiments performed on red cell lysed canine blood gated on lymphoid cells in the presence of 10% dog serum. Data acquired on the ZE5™ Cell Analyzer. Figure A. Purified Mouse anti Dog CD45RA (MCA2036S) detected with Goat anti Mouse FITC (STAR70) and RPE conjugated Rat IgG1 isotype control (MCA6004PE). Figure B. Purified Mouse anti Dog CD45RA (MCA2036S) detected with Goat anti Mouse FITC (STAR70) and RPE conjugated Rat anti Dog CD8 (MCA1039PE). All experiments performed on red cell lysed canine blood gated on lymphoid cells in the presence of 10% dog serum. Data acquired on the ZE5™ Cell Analyzer. Figure A. FITC conjugated Mouse anti Canine CD3 (MCA1774F) and Alexa Fluor 700 conjugated Rat IgG1 isotype control (MCA6004A700). Figure B. FITC conjugated Mouse anti Canine CD3 (MCA1774F) and Alexa Fluor 700 conjugated Rat anti Canine CD8 (MCA1039A700). All experiments performed on red cell lysed canine blood gated on lymphocytes in the presence of 10% canine serum. Data acquired on the ZE5™ Cell Analyzer. Figure A. RPE conjugated Rat anti Canine CD8 (MCA1039PE) and FITC conjugated Mouse IgG1 isotype control (MCA928F). Figure B. RPE conjugated Rat anti Canine CD8 (MCA1039PE) and FITC conjugated Mouse anti Canine CD3 (MCA1774F). All experiments performed on red cell lysed canine blood gated on mononuclear cells. Figure A. FITC conjugated Mouse anti Canine CD3 (MCA1774F) and RPE conjugated Rat IgG1 isotype control (MCA6004PE). Figure B. FITC conjugated Mouse anti Canine CD3 (MCA1774F) and RPE conjugated Rat anti Canine CD8 (MCA1039PE). All experiments performed on red cell lysed canine blood gated on mononuclear cells. Figure A. FITC conjugated Rat anti Canine CD8 (MCA1039F) and purified Mouse IgG1 isotype control (MCA928) detected with Goat anti Mouse IgG1 DyLight 649 (STAR74D649). 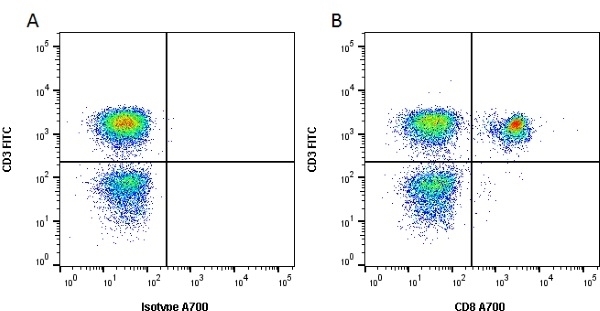 Figure B. FITC conjugated Rat anti Canine CD8 (MCA1039F) and purified Mouse anti Canine CD45RA (MCA2036S) detected with Goat anti Mouse IgG1 DyLight 649 (STAR74D649). All experiments performed on red cell lysed canine blood gated on mononuclear cells. R-phycoerythrin conjugated Rat anti Canine CD8 antibody, clone YCATE55.9 (MCA1039PE) used to evaluate CD8 expression on T cells by flow cytometry. 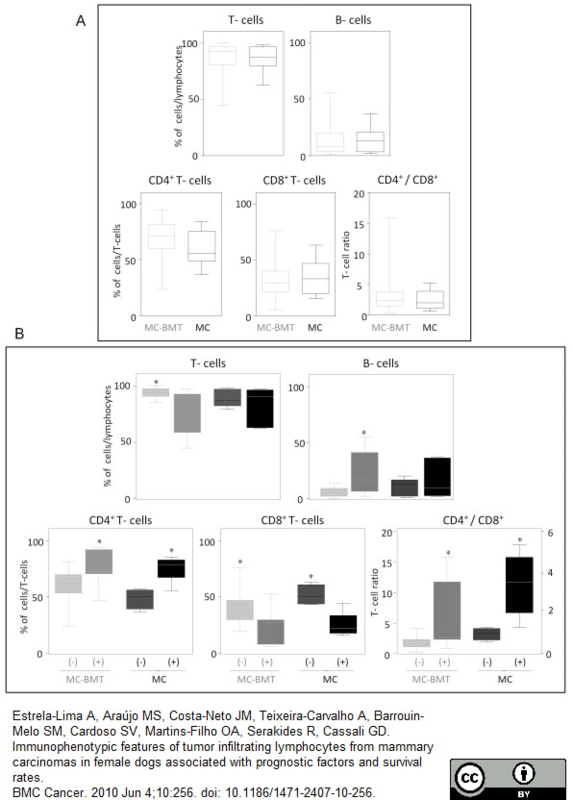 CD11b+CD14−MHCII− cells suppress T cell proliferation. 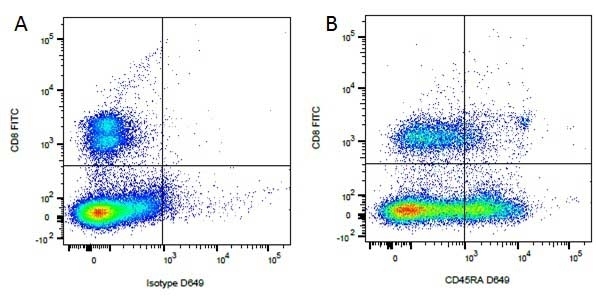 Facs sorted CD11b+CD14−MHCII− cells isolated from a dog with osteosarcoma or healthy PBMCs were co-incubated with mitogen-stimulated CD4+ and CD8+ T cells isolated from a healthy dog for 72 hrs. Non stimulated cells were used as negative control. Proliferative responses were measured by 3H-thymidine incorporation from experiments performed in triplicate. CPM, counts per minute. Mean ± SEM are shown. 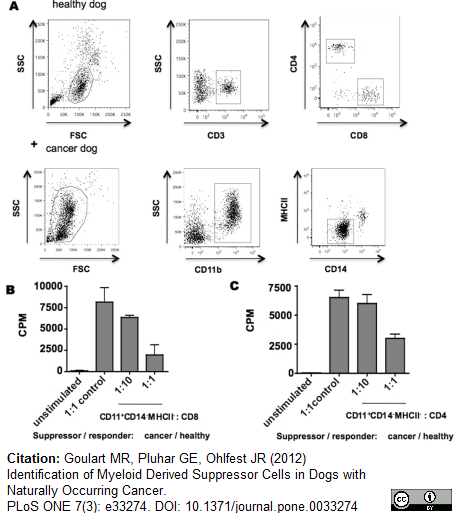 Identification of Myeloid Derived Suppressor Cells in Dogs with Naturally Occurring Cancer. R-phycoerythrin conjugated Rat anti Canine CD8 antibody, clone YCATE55.9 (MCA1039PE) used to assess CD8 expression on canine lymphocytes by flow cytometry. Immunophenotypic profile of tumor infiltrating lymphocyte in canine mammary carcinomas. Analysis of tumor infiltrating T-cells, B-lymphocytes and T-cell subsets from MC-BMT or MC (A), further subcategorized according to the absence (-) or presence (+) of lymph node metastasis (-) (B). 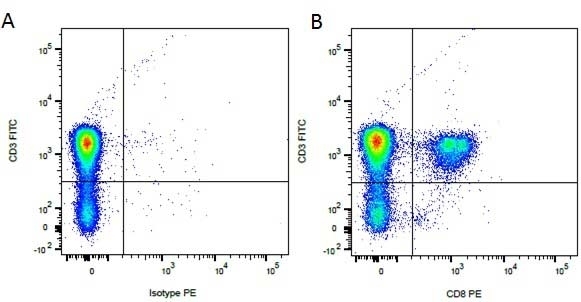 Lymphocyte populations and subsets were identified by flow cytometric immunostaining as described in Material and Methods. Data were expressed as percentage of positive cells within gated lymphocytes and CD4+/CD8+ T-cell ratio. Significant differences at p<0.05 are highlighted by asterisk. From: Estrela-Lima A, Araújo MS, Costa-Neto JM, Teixeira-Carvalho A, Barrouin-Melo SM, Cardoso SV, Martins-Filho OA, Serakides R, Cassali GD. Immunophenotypic features of tumor infiltrating lymphocytes from mammary carcinomas in female dogs associated with prognostic factors and survival rates. BMC Cancer. 2010 Jun 4;10:256. 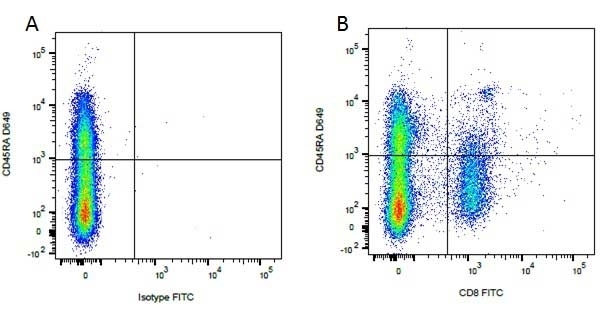 AlexaFluor 647 conjugated Rat anti Canine CD8 antibody, clone YCATE55.9 (MCA1039A647) used to assess CD8 expression on canine lymphocytes by flow cytometry. Representative dot plots illustrating the analysis of intracellular cytokine profile in T-cell subsets. (A) Pseudocolor plot distribution of short-term in vitro cultured (control or SLA-Ag stimulated) canine whole blood sample according to cell size (Forward scatter - FSC) and granularity (Side scatter- SSC) used for lymphocyte gate selection (R1) of FSCLowSSCLow events. (B) Pseudocolor plots representing cytokines + (IL-17, TNF-α, IFN-γ, TGF-β and IL-4) CD4+ cells within gated lymphocytes and (C) Pseudocolor plots representing cytokines + (IL-17, TNF-α, IFN-γ, TGF-β and IL-4) CD8+ cells within gated lymphocytes. The frequency of cytokines+ T-cells subsets were calculated by quadrant statistics approach and first reported as percentage of gated lymphocytes prior to the calculation of the SLAg/Control indexes. From: Costa-Pereira C, Moreira ML, Soares RP, Marteleto BH, Ribeiro VM, França-Dias MH, Cardoso LM, Viana KF, Giunchetti RC, Martins-Filho OA, Araújo MS. One-year timeline kinetics of cytokine-mediated cellular immunity in dogs vaccinated against visceral leishmaniasis. BMC Vet Res. 2015 Apr 11;11:92. Rat anti Dog CD8 antibody, clone YCATE55.9 was clustered as Canine CD8 in the First Canine Leukocyte Antigen Workshop (Cobbold et al. 1994). YCATE55.9 reacts with a rat cell line transfected with cDNA for canine CD8α (Gorman et al. 1994) and blocks MHC class I dependant T-cell responses in vitro and in vivo. Canine CD8 alpha chimaeric human IgG1 Fc fusion protein. Spleen cells from immunised DA rat were fused with cells of the Y3/Ag1.2.3 rat myeloma cell line. Gorman, S.D. et al. (1994) Isolation and expression of cDNA encoding the canine CD4 and CD8 alpha antigens. Tissue Antigens. 43 (3): 184-8. Br J Surg. 80 (11): 1389-92. Papadogiannakis, E.I. et al. 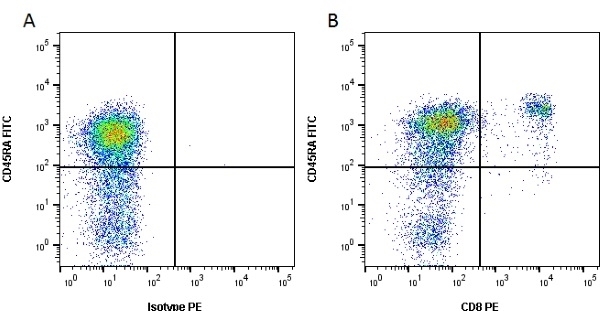 (2009) Determination of intracellular cytokines IFN-gamma and IL-4 in canine T lymphocytes by flow cytometry following whole-blood culture. Can J Vet Res. 73 (2): 137-43. Benyacoub, J. et al. (2003) Supplementation of food with Enterococcus faecium (SF68) stimulates immune functions in young dogs. Bird, R.C. et al. (2010) An autologous dendritic cell canine mammary tumor hybrid-cell fusion vaccine. Cancer Immunol Immunother. 60: 87-97. Bund, D. et al. (2010) Canine-DCs using different serum-free methods as an approach to provide an animal-model for immunotherapeutic strategies. Estrela-Lima, A. et al. (2010) Immunophenotypic features of tumor infiltrating lymphocytes from mammary carcinomas in female dogs associated with prognostic factors and survival rates. Huang, Y.C. et al. 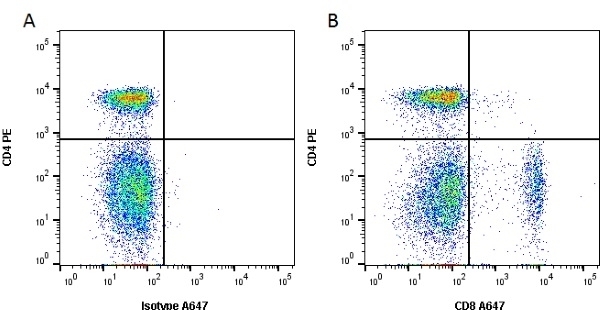 (2008) CD5-low expression lymphocytes in canine peripheral blood show characteristics of natural killer cells. J Leukoc Biol. 84: 1501-10. Kornegay, J.N. et al. (2010) Widespread muscle expression of an AAV9 human mini-dystrophin vector after intravenous injection in neonatal dystrophin-deficient dogs. Pichavant, C. et al. (2010) Expression of dog microdystrophin in mouse and dog muscles by gene therapy. Pinheiro, D. et al (2011) Phenotypic and functional characterization of a CD4(+) CD25(high) FOXP3(high) regulatory T-cell population in the dog. Reis, A.B. et al. (2006) Phenotypic features of circulating leucocytes as immunological markers for clinical status and bone marrow parasite density in dogs naturally infected by Leishmania chagasi. Clin Exp Immunol. 146: 303-11. Figueiredo, M.M. et al. (2014) Expression of Regulatory T Cells in Jejunum, Colon, and Cervical and Mesenteric Lymph Nodes of Dogs Naturally Infected with Leishmania infantum. Costa-Pereira, C. et al. (2015) One-year timeline kinetics of cytokine-mediated cellular immunity in dogs vaccinated against visceral leishmaniasis. BMC Vet Res. 11 (1): 92. Schaut, R.G. et al. (2016) Regulatory IgDhi B Cells Suppress T Cell Function via IL-10 and PD-L1 during Progressive Visceral Leishmaniasis. Tagawa, M. et al. (2016) Evaluation of Costimulatory Molecules in Peripheral Blood Lymphocytes of Canine Patients with Histiocytic Sarcoma. PLoS One. 11 (2): e0150030. Riondato, F. et al. (2015) Analytical and diagnostic validation of a flow cytometric strategy to quantify blood and marrow infiltration in dogs with large b-cell lymphoma. Cortese, L. et al. (2015) An immune-modulating diet increases the regulatory T cells and reduces T helper 1 inflammatory response in Leishmaniosis affected dogs treated with standard therapy. BMC Vet Res. 11: 295. Miller, J. et al. (2015) Humoral and Cellular Immune Response in Canine Hypothyroidism. J Comp Pathol. 153 (1): 28-37. Riondato, F. et al. (2016) Identification of a suitable internal control for fluorescence analysis on canine peripheral blood samples. Vet Immunol Immunopathol. 172: 38-42. Martini, V. et al. (2015) Canine small clear cell/T-zone lymphoma: clinical presentation and outcome in a retrospective case series. Gelain, M.E. et al. (2014) CD44 in canine leukemia: analysis of mRNA and protein expression in peripheral blood. Duz AL et al. (2014) The TcI and TcII Trypanosoma cruzi experimental infections induce distinct immune responses and cardiac fibrosis in dogs. Mem Inst Oswaldo Cruz. 109 (8): 1005-13. Viana, K.F. et al. (2015) Setting the proportion of CD4+ and CD8+ T-cells co-cultured with canine macrophages infected with Leishmania chagasi. Vet Parasitol. 211 (3-4): 124-32. Bromberek, J.L. et al. (2016) Breed Distribution and Clinical Characteristics of B Cell Chronic Lymphocytic Leukemia in Dogs. J Vet Intern Med. 30 (1): 215-22. Mie K et al. (2016) Influence of transfusion of lymphokine-activated T killer cells on inflammatory responses in dogs after laparotomy. Miglio, A. et al. (2014) Acute undifferentiated leukaemia in a dog. Aust Vet J. 92 (12): 499-503. Villaescusa, A. et al. (2015) Effects of doxycycline on haematology, blood chemistry and peripheral blood lymphocyte subsets of healthy dogs and dogs naturally infected with Ehrlichia canis. Vet J. 204 (3): 263-8. Fiuza JA et al. (2015) Vaccination using live attenuated Leishmania donovani centrin deleted parasites induces protection in dogs against Leishmania infantum. Perosso, J. et al. (2014) Alteration of sFAS and sFAS ligand expression during canine visceral leishmaniosis. Vet Parasitol. 205 (3-4): 417-23. Poggi A et al. (2016) Prognostic significance of Ki67 evaluated by flow cytometry in dogs with high-grade B-cell lymphoma. McGill, J.L. et al. (2016) Vaccination with an Attenuated Mutant of Ehrlichia chaffeensis Induces Pathogen-Specific CD4+ T Cell Immunity and Protection from Tick-Transmitted Wild-Type Challenge in the Canine Host. PLoS One. 11 (2): e0148229. Villaescusa, A. et al. (2012) Evaluation of peripheral blood lymphocyte subsets in family-owned dogs naturally infected by Ehrlichia canis. Comp Immunol Microbiol Infect Dis. 35 (4): 391-6. Schaut RG et al. 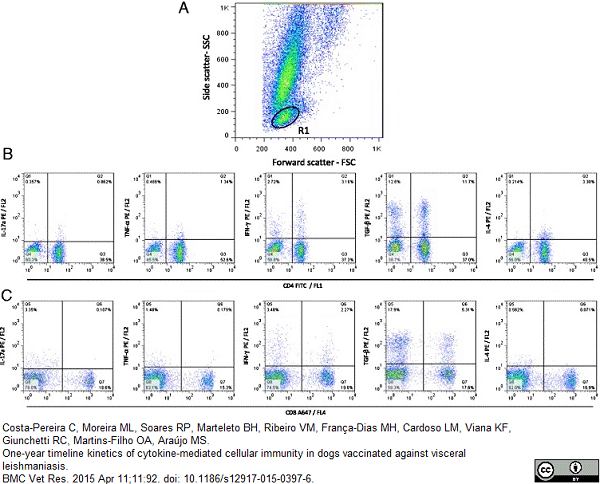 (2016) Recovery of antigen-specific T cell responses from dogs infected with Leishmania (L.) infantum by use of vaccine associated TLR-agonist adjuvant. Miranda, S. et al. (2007) Characterization of circulating lymphocyte subpopulations in canine leishmaniasis throughout treatment with antimonials and allopurinol. Vet Parasitol. 144 (3-4): 251-60. Viana, K.F. et al. (2016) Application of rapid in vitro co-culture system of macrophages and T-cell subsets to assess the immunogenicity of dogs vaccinated with live attenuated Leishmania donovani centrin deleted parasites (LdCen-/-). Mitchell, L. et al. (2012) Induction of remission results in spontaneous enhancement of anti-tumor cytotoxic T-lymphocyte activity in dogs with B cell lymphoma. Vet Immunol Immunopathol. 145 (3-4): 597-603.